For the first time since Scott Hinkle’s first season back as head coach in 2014, Liberal wins two games at their mid season tournament. 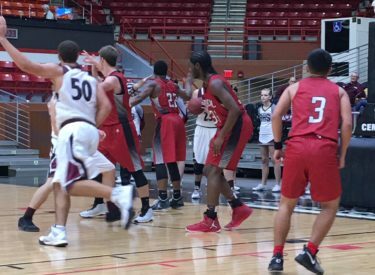 That’s after Liberal 47-45 win over #9 4A Buhler Saturday afternoon in the Salina Bicentennial Center. Liberal’s defense led to transition opportunities throughout the game. The Redskins bolted to an 11-4 lead after one and 25-16 at the half. The Skins led 37-32 after three quarters. The Redskins made 5-10 three pointers in the win. Markalyn Eatmon broke a mini slump with 11 points and three three pointers. Cade Hinkle added 10 and Kylan Thomas dropped in eight. Thomas was named to the all tournament team. Liberal is 10-2 and Buhler is 9-4. Buhler defeated LHS at the same tournament last year. The Redskins play at Hugoton Friday night at about 8 on 1270 and kscbnews.net.